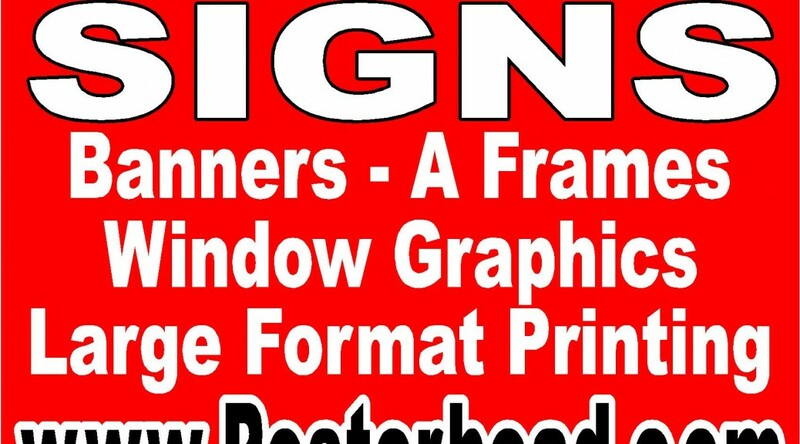 April 22, 2019 Robert W.
Las Vegas window perf printing allows for graphic signs to be placed on your business windows that allow you to see out, with people on the outside only to see what you have printed on your graphics. These custom window perf signs are great for advertising as they turn a plain, ordinary window into a small billboard for your customers to see and promote your products and services. Las Vegas window perf printing is cheap and a low cost approach to advertising. 2. Security as it allows you to see who is coming into your business before they are able to open the door. Many secretaries like this because they feel less threatened and startled. Window perforation signs are also great for back glass on service trucks and other company vehicles to promote your company. Las Vegas window perf printing allows for a full color print that can include any color or combination of colors as well as having pictures of your products and logos printed on the window perf as well. The window perf then attaches to the outside of your window and will last several years. The window perf can be installed by a sign professional or there are several You Tube videos showing how to install your own window perf. The installation process is not hard and many people elect to install it themselves to save money. 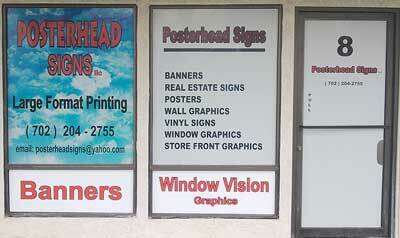 Las Vegas window perf printing can be designed and printed at your local sign store in your area. Its affordable and a easy solution for advertising on your store windows. July 18, 2016 Robert W.
Most businesses use some version of Las Vegas store window graphics on their store’s windows. It can be as simple as white vinyl lettering on your door to let everybody know your company name and your store hours. It can also be as complex like McDonalds Hamburgers who use their windows extensively as a means to advertise their business. It seems every McDonalds uses colorful neon paint on their windows to advertise different food products and window perforated graphics ( see through window graphics) on their drive through windows ( so the McDonalds employees an see out and you see some form of printed advertisement on the window) This hamburger chain, along with fast food chains like Taco Bell and Burger King, are masters at utilizing their windows for maximum advertising exposure. Las Vegas store window graphics can be very cheap, but yet most effective. For example, simple vinyl lettering on your windows for your business door might cost about $25.00 and are easy to install yourself. There are several self help You Tube videos to assist you in installing these types of graphics. More sophisticated window graphics include window perforated graphics that cost around $3.50 a square foot and install much the same way as wallpaper and window tint does. Again, there are You Tube videos available to help you install these graphics. Contact a local sign shop to see how window graphics can help your business. Vegas Window Graphics For Store Sales Improvement. Vegas window graphics is a sure fire way of improving the looks of your store in Las Vegas. Simple plotted vinyl letters can greatly enhance the marketability of your business. One of the simplest of all Vegas window graphics is just putting the basic company information on your entrance door or a window near the entrance door. This information will include your company name, telephone number, web site address, hours of operation and other simple information in white vinyl lettering. You can have a professional install your lettering or you can actually install the vinyl lettering yourself because it is not that difficult. The cost of simple door lettering will be less than $40.00. The standard color for door or window graphics is white or yellow, as they tend to look the best and are clearly visible versus the darker vinyl colors. An upgrade for Vegas window graphics would be putting the information of what your business does on the window or maybe advertise a special. For example, if you are a air condition company, near summer time you would advertise in large vinyl letters a tune up a/c special and a price to attract new customers. Near the winter time, your a/c company would advertise in vinyl letters a heater tune up special to get everybody ready for the Las Vegas winters. Again, you can simply go to a sign shop and have them plot your vinyl letters and install them yourself. Installing vinyl letters is much like window tint or wall paper installation…..a little practice and you can usually do it yourself. As for the design of your Vegas window graphics, you can go online or use such graphic design programs as Photoshop or Adobe Illustrated and design your own Vegas window graphics to the specifications of your own windows. Paradise Nevada Banners Will Get Your Business Results. Paradise Nevada banners will get your business much needed marketing results in these tough economic times. With the economy the way it is, businesses need to use whatever marketing techniques they can in order to survive in these economic times. Paradise Nevada banners affords businesses the cost effective solution in assisting them in achieving their sales and marketing goals. Paradise Nevada banners are vinyl banners in different sizes that allow a business to advertise their goods and services in a large way by placing their advertising on a large vinyl banner. The vinyl banners are not expensive and can be seen from far away. The cost of a normal vinyl banner is about $2.00 a square foot and will come with grommets on the top and bottom for easy hanging. Many times, sign shops will have vinyl banner specials. Typically, you can get a 3ft. by 8ft. 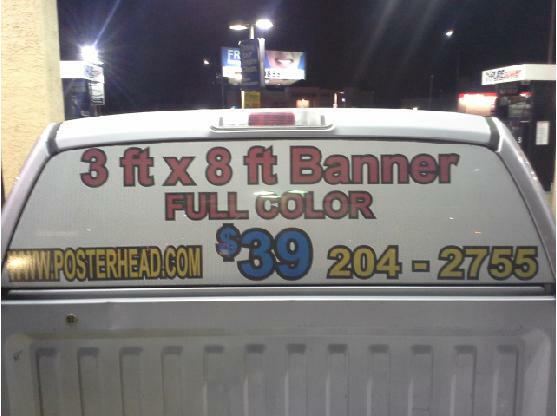 full color vinyl banner for $39.00 if the sign shop has a special going. This price also includes design. The banners are printed on a 13 ounce banner material with large format printers using eco solvent or latex inks that are designed for both indoor and outdoor use. These inks are very long lasting and produce bright and vivid colors. Many businesses rotate their banners they have in sequence so that it appears they always have new specials and products on sale. This gives the business or store a fresh appearance rather than a stale look for consumers. The Paradise Nevada banners are then placed on the outside of the building, near the top, so that they can be seen from far away. Passing motorists and pedestrians are more likely to see the vinyl banners when they are up high since the view will be unobstructed. If you are looking for vinyl banners, just do a Google or Yahoo search for vinyl banners and contact your local sign or print shop. There is a new technology in the sign industry that allows you to print on see thru window decals. The see thru window decals are one way which allows you to see outside and the people to see only what you have printed on the outside. See thru window decasl are known by other names as well. These other names include perforated window graphics, see thru window vision, window vision, one way window graphics and a bunch of other less known terms. However, they all relate to one product that allows you to print on the outside of the material, usually a 60/40 printable material, that allows you to see outside and the public to see only what you have printed on the outside. The see thru window decals are very popular on business windows and car windows as well. Several fast food franchises use see thru window decals to decorate their business windows and advertise on them to lure you into the store. While inside the store, the customer can look out the window with an unobstructed view while eating and enjoy privacy since the people on the outside cannot see them. This privacy works well for automobiles as well. The driver can look outside through the windows but the other drivers or pedestrians cannot see in. This works well for security reasons to protect yourself, but also for any type of equipment or packages you have in the car because the window vision blocks their view inside. See thru window decals are becoming more and more popular for the above reasons and also for one more important reason, the see thru window decal is like a window tint that reflects heat. In Las Vegas, that’s very important when it comes Summertime and it is 110 degrees outside and your air conditioner is working hard. Las Vegas is a great place to use window and door graphics “Window Vision” to advertise your goods and services to your customers. They are a very effective and cheap way to advertise on existing doors and windows of your office or store. Advertising this way can be done without burdensome city inspection permits. Businesses put their store name, hours of operation, phone numbers and website on their front doors to help their customers know there hours of operation and contact information if the store is not open. Other easy door and window graphics are putting vinyl letters on your windows showing what products and services you sell. For example, if you are the owner of a beauty salon, the window graphics you would put on a window would be related to your services. Words like nails, haircuts, eyebrow threading, perms, hair coloring are all words that can let your potential customers know what type of services you provide. The vinyl lettering can be in a variety of colors. The most common colors of window and door graphics in Las Vegas are sunburst yellow and white vinyl letters. These 2 colors show very well against the background of tinted glass. Most businesses have tinted glass in Las Vegas because of the extreme heat that we have. While it’s a little off the topic, window vision, or see through window graphics are also a popular choice in Las Vegas. 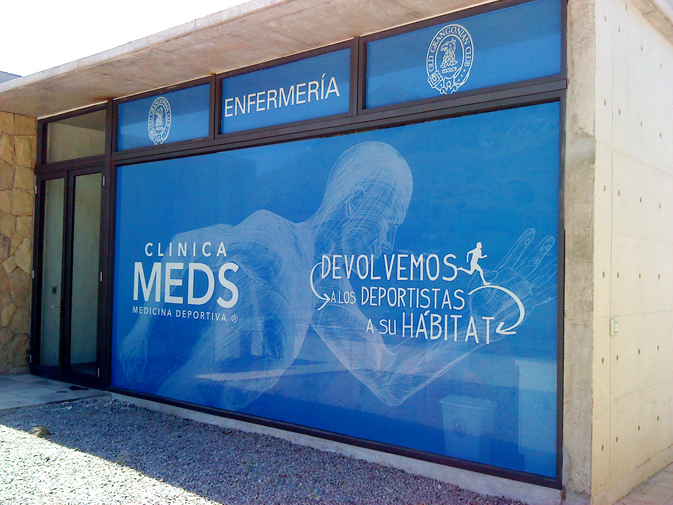 Window vision or see through window graphics allow you to see out of the window but only allow a customer to see your printed advertising from the outside. Window vision, or see through window graphics is a economical form to advertise on your windows and also saves money by helping to block out the extreme heat of the sun during the summer months in Las Vegas. 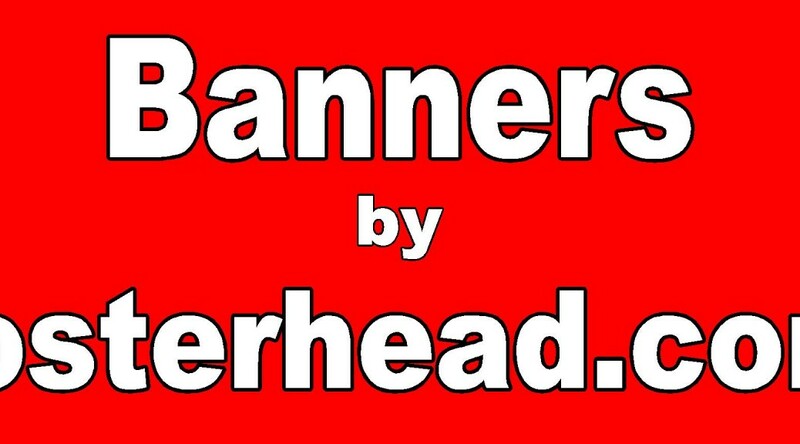 Posterhead Signs a proud seller of window vision and window graphics, door graphics and see through window graphics at an affordable price.